Today is Monday, Feb. 1, 2016 and it's the start of National School Counseling Week. I want to emphasize "Counseling" and not"Counselor" Week. There is a big difference. Today is the start of a week long effort to promote our profession and to let others know the great work that we do. 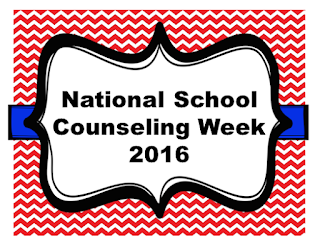 I know many school counselors feel that it should be a week of feeling appreciated by our staff and schools. 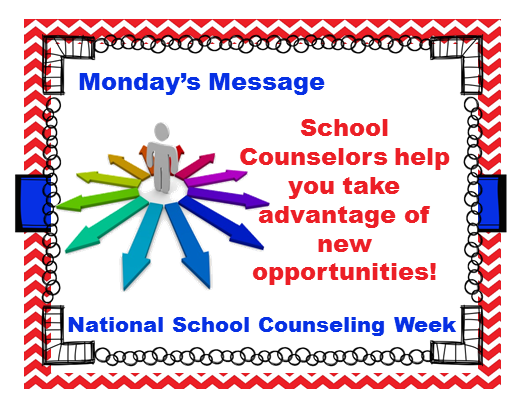 It is terrific that there are many schools that celebrate their counselors this week, but many, however do not. It does not mean you are not appreciated, respected, honored, or deserving of such celebrations. It just means that we need to toot our own horns and let people know all the good things we're doing. When you are the sole counselor in a building, you may not get the opportunity to have your staff observe you with the students or understand the complexity of your position. Therefore it is important to share. Here is my Monday Message that I shared with the staff in their mailboxes. It all fits into ASCA's Recipe for Success 2016 theme. 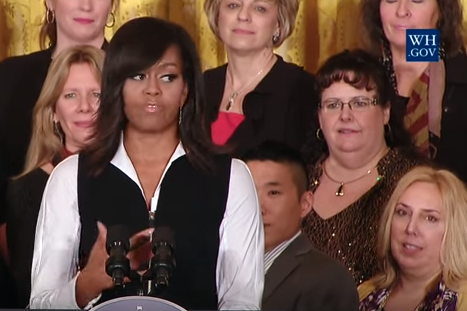 You can find additional resources here to get your #NSCW16 started. They also have a photo challenge and I'd love to see your pictures of you in all the challenges! My most special pictures for #NSCW16 will all come from the ASCA SCOY festivities. There I am. . .in gold, front and center. Want to see the ceremony? You can here. Join me tomorrow for Tuesday's message! Essay writing is considered a very high level profession and schools are emphasizing a lot for developing great essay writers in childhood stages of students. In order to make their children understand the value of essay writings it is very smart of them to arrange educational trips. It encourages them all to produce high quality content.